«The city of Sochi is a major seaside resort in Russia. Hence the name of our dating site that can be roughly translated as ‘Getting acquainted in Sochi’. We aim to provide opportunities for those who wish to find a friend or a romantic partner here. 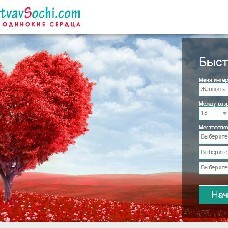 On our dating site you will find a lot of gifts and tokens that are linked to Sochi.